With fourteen HBO specials, five Grammys, a critical Supreme Court battle over censorship, and countless appearances on the international comedy circuit, George Carlin saw it all and made fun of most of it. Carlin’s journey to stardom began in the rough-and-tumble neighborhoods of New York in the 1950s, where class and culture wars planted the seeds for some of his earliest material including the infamous Seven Dirty Words routine. Carlin describes his major influences as an up-and-coming comic, talking about the origins of some of his most famous stand-up routines. The people he encountered on his rise to stardom reads like a Who’s Who of 1970s celebrity, from Lenny Bruce who took him under his wing to Hugh Hefner who gave him his first big shot. Carlin spares no details as he describes his life and career. He discusses his own battle with substance abuse, his often turbulent relationships with the women in his life, and the politics that informed so much of his stand-up. From the high points on stage to low points in the hospital, Last Words is George Carlin’s life told with the same brash, unblinking honesty that defined his comedy. It was a bit hard to understand his brother, his NY accent and smoker's voice was very difficult. Hearing some of the very long and drawn out stories of his drug and alcohol binges could have been whittled down also. 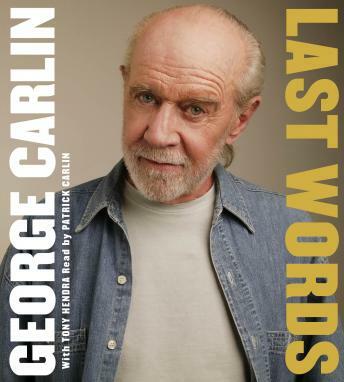 As a longtime fan of George Carlin, I definitely looked forward to the release of this book. As read by his brother Patrick Carlin, you sometimes forget who you're listening to. With typical Carlin insights, the book is an interesting romp through the life and times of a man who went from TV star to road comedian to gold albums to movies and HBO specials. Along the way we are introduced to his childhood, his mother, his father, his brother, his first wife and a crazy journey through drugs, wild success, regrets, and ultimate triumph as one of the greatest and most innovative comedians of our time. If you are a Carlin fan (especially of his later material), it is worth a listen.